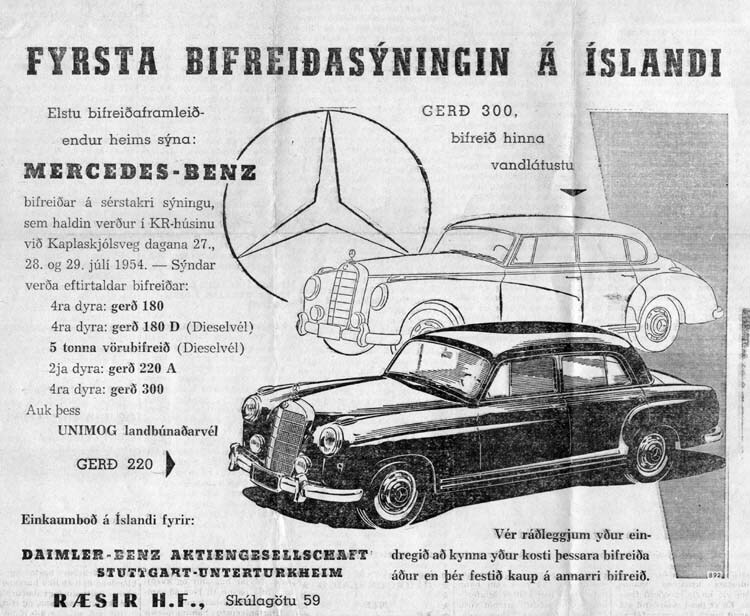 During the days of July 27-29, 1954 the first real automobile show took place in Iceland. 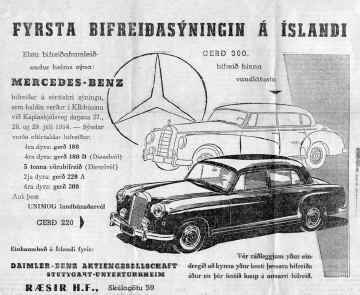 Daimler-Benz AG, in cooperation with its Icelandic sales division Raesir, brought six new Mercedes-Benz vehicles to Iceland; one Type 300 "Adenauer" limousine, two Type 180 Ponton sedans (gasoline and diesel), a Type W187 220 cabriolet (pre-Ponton style), a truck (Type 4500 Lastwagen) and one Unimog. 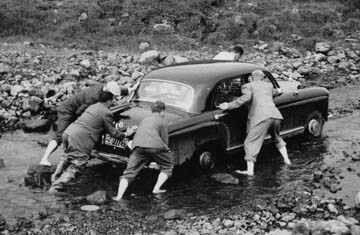 After the show, the cars were driven around the country and evaluated in various Icelandic conditions (see photo 4). During the 1950s, the Icelandic economy was very short of foreign exchange. Cars, petroleum and building materials were mainly imported in exchange for fish products. The Mercedes-Benz people on the other hand wanted to sell us cars in trade for live Icelandic horses (see photo 3). Since then, thousands of Icelandic horses have been exported, mainly to Germany and the US. Photo 3. 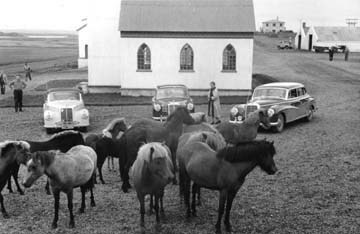 Three of the Mercedes-Benz cars with Icelandic horses. Left to right: Type W187 220 cabriolet (pre-Ponton), Type 180 Ponton sedan, Type 300 "Adenauer" limousine. A newspaper article dated August 6, 1954 says: "It is fun to mention that manager Oeser has bought a horse, which he will bring back to Germany. He has offered to buy 300 horses, and believes that 12 horses will cover one car. This is a new and very interesting business method." 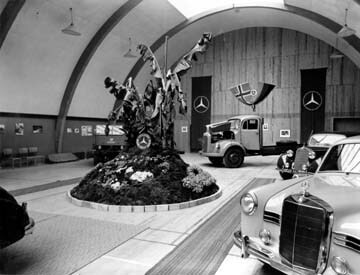 Mr. Oeser was an export manager of Daimler-Benz in Stuttgart, and he offered to buy 300 horses in exchange for 25 cars. I am not sure whether this was done or not, but never the less, we have exported thousands of horses to Germany since that day. There were about 100 Pontons imported to Iceland in the next years, including the one my father bought in 1955 which is shown on my own Ponton page. In 1955, the Icelandic government bought two Type 300 "Adenauers" for the minister of foreign affairs and minister of education. At least one other minister got a Type 220.